With ExcelSync your accounting data is available in Excel. No more need to copy and paste or to export and import. You add new transactions and your Excel Sheets are instantly updated and calculated. For Apple/Mac this feature is not available. ExcelSync use VBA Macros. This technology has been replaced by the more recent Excel Add-in. We invite you to use the Excel Report Add-in. The ExcelSync functions are used to retrieve from Banana in Excel the current accounts balances. The costs are then divided among customers using normal Excel Formulas. You could use the example to create a division of the apartment costs. In this example we take the data from the two years and create a graphic. The amount of the segments are diveded also by segments. ExcelSync are Excel User defined functions that allow to synchronize in real time your Excel spreadsheet with the data from Banana Accounting. You update you accounting file, adding new transactions, and instantly you get your Excel Sheets updated. Excel has the ability to integrate documents and data that are made available throught the internet protocol. Banana includes a web server, and a RESTful API, that can be accessed through http protocol. ExcelSync uses the Banana integrated web server to retrive data on real time. Banana ExcelSync are functions, with the name that start witht the "B", that you can use within the cell to retrive accounting data. You can dynamically retrieve the take data from Banana Accounting. Easy to use formulas that let you calculate values for periods and create powerful spreadsheets for evaluating, presenting accounting data or creating graphics. Banana ExcelSync are Excel User defined functions (UDF), small Visual Basic Programs that extend Excel allowing to insert formula within the cell. Banana ExcelSync requires a recent version of Excel, and due to the Excel Mac limitations works only on Windows versions. In order to use the ExcelSync UDF you need an Excel file with the extension *.xlsm. Banana ExcelSync UDF make use of the Banana web server. 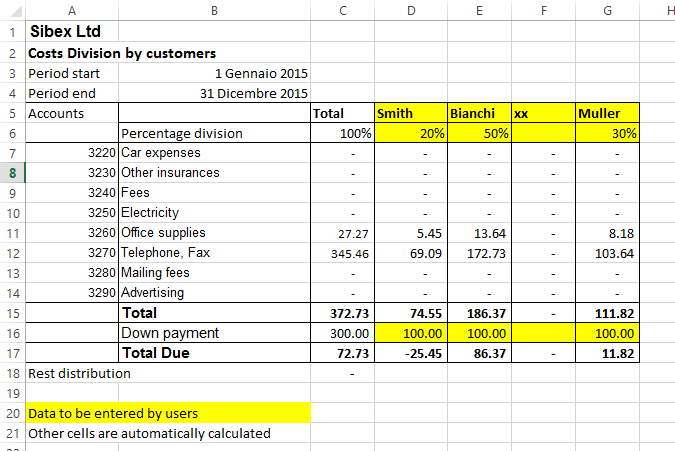 You can extend the ExcelSync by adding other functionalities. Download the Excel spreadsheet with examples files. Open the Banana accounting files "company_2019.ac2" and "company_2020.ac2"
If you open a file and Banana or the Banana Web Server are not running, Excel will wait until it can contact the Banana Web server. Start the Banana and the Banana Web Server. Most ExcelSync functions require, as first parameters, a name of a Banana Accounting file. The file must be openened in Banana. You use only the file name without the directory. DO NOT use the file name directly in the fuctions. Instead use a reference to a cell, that contains the file name. You can use the same spreadsheed also for differrent years. You only need to change the file name in on cell. If Banana Accounting is not open of the Banana webserver is not active you don't have to wait. The best way is the one used in the example file.